After the big trade yesterday, Minnesota might see their price rise, and over time, New England might see it fall if the loss of Moss turns into losses for the Pats. For now, the trade has probably not made enough of an impact to affect the Leaderboard yet. Here is the leaderboard for Week 5. After their first big road win in many, many games, the Patriots shoot to the top. It will be interesting to watch if there is any backlash among fans with the trade of Moss, which might drive prices down. Just something to watch over their bye week. Chicago, Dallas and Pittsburgh make up the rest of the top-4, just like last week. What is odd is that these teams had a combined 0-2 record last week (Dallas was on their bye), so at least for these fanbases, historically strong ones, losing games might not be as detrimental to ticket prices as for other, more inelastic fanbases. The top eleven teams were all in the top-12 last week. The newcomer is the Washington Redskins, off their second divisional win. The Texans dropped out after their slightly flat showing at Oakland. Detroit curiously dropped over $10 after a close loss to a seemingly far superior team. The Lions have home games coming up, and Matt Stafford may be returning soon, which could help raise prices. 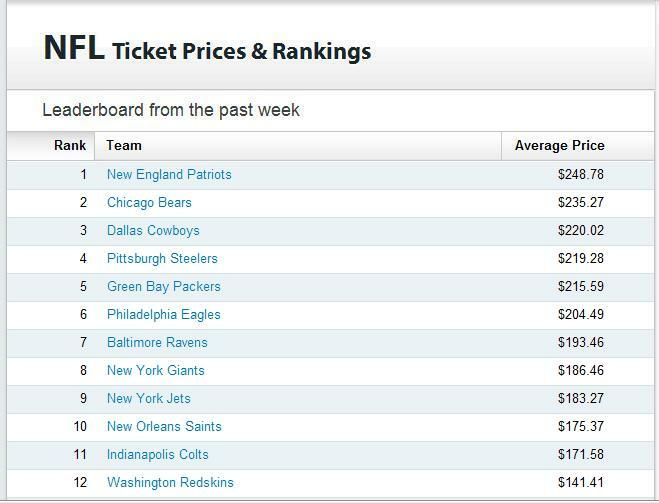 The Chiefs did go up $8 dollars over the bye, which helps support my post last week that predicted that the Chiefs ticket prices would increase as the team gets closer and closer to home games. Close loses may not have helped the Lions, but both the 49ers and Panthers saw their prices rise about $8 after losing 16-14 to teams that are now 3-1. 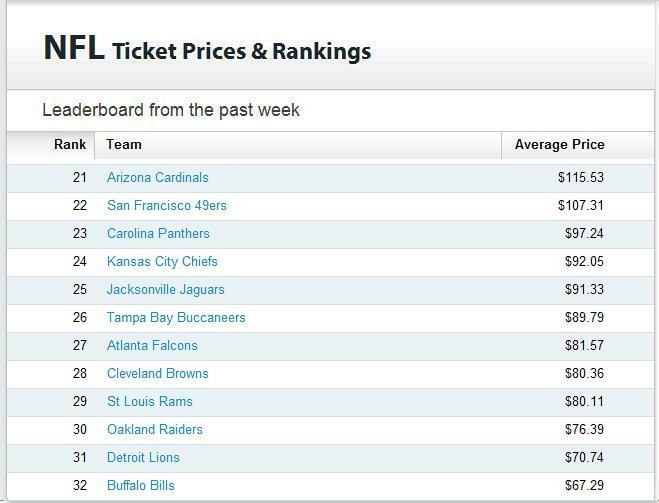 With so much of the league 3-1 or 2-2, it is strange that the ticket prices barely moved over the past week. I guess as more weeks pile up, and teams get into good long, extended runs or streaks it could lead to teams rising up the leaderboard quickly. Comments, questions, ideas of why teams prices are not moving that much? Feel free to leave a comment, or tweet us up at @SeatGeek. ‘Till Next Time.